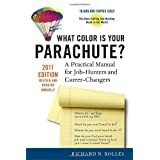 What Color Is Your Parachute 2011: A Practical Manual for Job-Hunters and Career-Changers ReviewThis excellent book has been in multiple reprints since about 1970 and is extremely helpful in many ways. 1.How Employers Hunt for Job-Hunters. In this chapter, Bolles clearly lays out the harsh realities of the differences between people looking for work and those seeking jobs. The power lies with the employer, and the sooner I realized that truth, the better off I was. This chapter also pointed out that different types of resumes work better for different types of employers, so it's important to tailor your resume to your audience. This was a great lesson for me. 2. Tips. What I loved about this chapter was the reinforcement that job hunting is hard work and takes effort, there is no getting around it. I also thought it was great advice to be open to changing my tactics if what I was doing wasn't working. Too often I get caught up in the thinking that just doing more of the same will change my result. I now realize that sometimes I am just doing the wrong things, so need to try something different. 3.Interviewing Tip For Smarties: Another great chapter that reset how I think about interviews. One of the best tips for me was sticking to the time I asked for from the interviewer. Too often in the past if I thought the interview was going well, I would keep talking. Now I realize that one of the best ways to impress a potential boss is to stick to the time (e.g., 20 minutes) that I originally asked for. The other very helpful tip was to let the interviewer do 50% of the talking. This balance of time lets the interviewer know that you know how to listen as well as speak. Too much talking by me tells them I might ignore the needs of the company: too little speaking by me might tell them I am trying to hide something. Good input! Overall, I thought this book could be extremely helpful to a lot of job seekers, since it provides a wealth of insight into what the employers are looking for and how they are approaching the hiring process. After all, it involves two parties trying to see if there is a match, so it's very important to know what the hiring manager is thinking and how they are approaching this process. Another book that I thought was extremely helpful in terms of applying to my job search was "GOAL! Your 30 Day Game Plan" Goal! : Your 30-Day Game Plan for Business and Career Successwhich helped organize my efforts and kept me motivated along the way towards my new job. Want to learn more information about What Color Is Your Parachute 2011: A Practical Manual for Job-Hunters and Career-Changers?